Luna is a rising 4, 15.3hh mare by Woodlander Rockstar out of a Davignon mare. Backed last year and turned away over the winter she was restarted in March. She has 3 super, active paces and great hind leg. Sane, totally straightforward, she’s been incredibly easy to do. She’s got a fantastic attitude and brain, she’s forward without being silly. She hacks out alone and in company, and is excellent in all traffic met to date, including farm traffic. Good to box (trailer or lorry), catch, shoe, clip etc. Lives in or out. She’s been out to do a 4-y-o, Young Horse class was impeccably behaved with lovely comments from both judges. 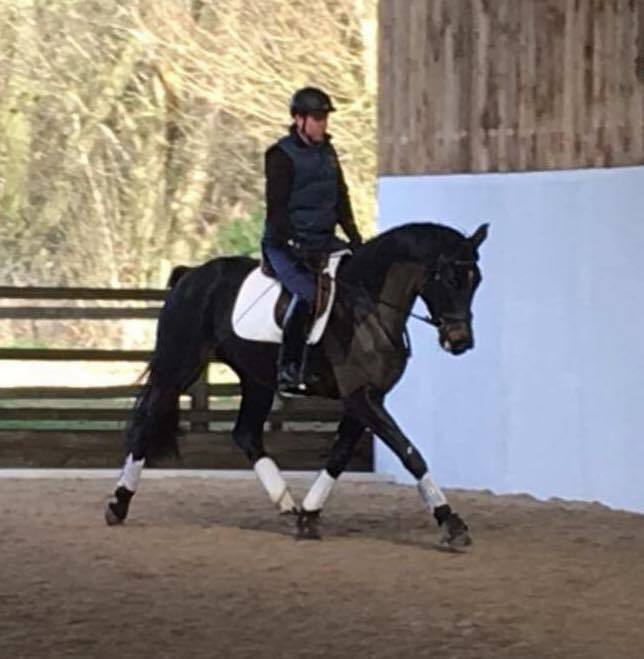 She’s not been rushed or produced, she’s been correctly started, she is happy in her work and really nicely off the leg, she’s not been forced into an outline, has super natural balance and cadence. A couple of things though… please don’t come and view her if you expect her to ride like a 5-y-o. She’s 4 and been back under saddle 10 weeks. However she doesn’t need lunging before you get on and is very sensible. She’s small standing 15.3hh, so again don’t come and say I wish she was bigger/smaller. I have a video which I can WhatsApp or you can view on our FB page, but due to poor download speed I cannot upload to YouTube. Bred by us, she is nowhere near big enough for Emma and I have too many horses to keep her. A full set of clean X-rays available.